School Education Minister Mantri Prasad Naithani today called upon the teachers to ensure qualitative education in schools and also assured them of a transparency in transfers. Villagers at Sobla in Dharchula subdivision of the district held a protest against not providing jobs to them as a survey on the recently sanctioned 220 MW Dhauliganga phase-II started today. More than 56,000 fourth class employees of the state government working in 36 government departments started their strike in support of their demands today. The members of the Fourth Class Employees Federation started their protest in front of th state Assembly here. Congress activists in Haridwar today criticized Gujarat Chief Minister Narendra Modi for targeting the Nehru-Gandhi family at the BJP national council meeting at Talkatora Stadium in New Delhi. BJP workers belonging to the Pandit Deen Dyal Upadhaya Mandal of the party burnt an effigy of the state government at Niranjanpur Mandi here today in protest against the proposed excise policy. With illegal quarrying still going on in the district despite a ban by court, Haridwar SSP Arun Mohan Joshi has directed all circle officers and station house officers to take strict action again the offenders. Kumaon University is facing an acute financial crunch and is unable to release salaries to the staff. The 12th bird watching camp was organised at Kolhuchaur in the Lansdowne Forest Division by the eco-tourism wing of the Uttarakhand Forest Department from March 1 to 3 in which 110 species of birds, including the rare ones, were sighted. 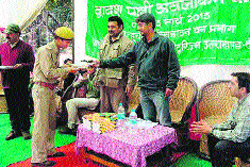 Participants of a bird-watching camp being given certificates at a function organised by the eco-tourism wing of the Forest Department on Monday. Rabi crops in valleys of Champawat district have been affected due to lack of water in more than half the total number of irrigation canals, which were damaged at the head level in landslides last month. The Horticulture Department has been forced to go in for cloned rootstock of apple procured from European countries following a rise in temperature and reduction in the cooling period, which is essential for maturing of this major cash crop of Uttarakhand. The farmers are being encouraged to plant imported spur varieties of apple. Frost during the months of January and February in the Terai region has damaged flowering in mango trees and the Department of Horticulture has begun assessing the damage. The Energy and Resources Institute (TERI), New Delhi, in collaboration with the Union Ministry of Sports and Youth Affairs, the Uttarakhand State Council for Science and Technology (UCOST), Dehradun, and Doon University, Dehradun, conducted a seminar in the Senate Hall of the university here today. It aimed at sensitising the youth to the issues pertaining to green growth and sustainable development. A delegation of home guard jawans met Chief Minister Vijay Bahuguna here today and apprised him of their problems. It told the Chief Minister that despite assurances by the minister concerned their remuneration had not been hiked. 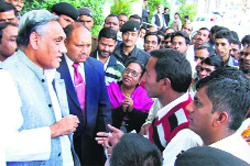 Chief Minister Vijay Bahuguna meets a delegation of Home Guard jawans in Dehradun on Monday. Chief Minister Vijay Bahuguna today directed all departments to ensure that the benefits of schemes meant for the SC/ST communities should reach the genuine beneficiaries. Noted poet, writer and "Tarak Mehta ka Ulta Chashma"-famed Shailesh Lodha expressed happiness that the genre of "Hasya-Kavita", which was on the decline, has once again revived, much of the credit goes to television. With no exposure available in Uttarakhand for budding actors, who want to make it big in silver and small screen, a group of youngsters hailing from Haridwar have opened a training institute to hone their skills and provide exposure to the young talent. A salad decoration competition was organised during the ongoing Youth Festival at Shravan Nath Jawahar Lal Nehru College here today. Speaking at a function to bid farewell to primary teachers of the district schools, Naithani said the state government schools should endeavour to bring the standards of education on a par with private schools. "Today most of the government schools have thin attendance and teachers can raise the quality of teaching in these schools," he said. On the occasion, president of the Uttarakhand Rajya Prathmik Shikshak Sangh Virender Singh Krishali presented a 16-point charter of demands to the minister. The main demands include transfer of primary teachers, who have spent seven years in Chakrata, to plain areas of the state, District Education Officers (Basic education) be given independent charge of classes 1-8. This will ensure accountability and efficiency. Arrangement of cooking gas be made in schools for preparation of mid-day meals. Teachers who have been appointed after 2005 be given the benefit of pension, primary schools should not be run under public-private partnership (PP mode) and instead of involving teachers in the distribution of scholarships, the transfer of scholarship money should be made directly in the accounts of wards or their parents. The Uttarakhand Rajikya Prathmik Shikshak Sangh also presented mementos to the teachers as a gesture of appreciation for selflessly teaching all these years. The villagers alleged that locals were being neglected in job distribution in the project as agreed before its approval. “The project authorities are doing drilling work on the villagers land without taking them in confidence,” said Rukum Singh Bisht, a resident of Sobla village. According to NHPC sources, department engineers have started drilling work at the proposed project site to take stock of the depth of land where the power house and reservoir of the project has to be located. The villagers have threatened that if the NHPC administration will not provide employment to residents of the affected villages of Khim, New Suva and Sobla in the project, they will obstruct the survey work. “We want jobs in the project, besides taking the villagers' vehicles on contract by the corporation during the construction of the project,” said Bisht. The leaders of the fourth class employees alleged that despite assurances in the past nothing had been done by the state government to redress their grievances. They warned that they would intensify their stir in case the state government failed to address their demands immediately. They were demanding better pay and grades. The activists said it did not behove a leader of Modi’s stature to use such a foul language against the Gandhi family and demanded an apology from him. The party activists gathered at the District Collector’s office at Town Hall. Secretary of the state Congress unit JP Pandey told the gathering that the BJP was presenting Modi as its prime ministerial candidate forgetting the Gujarat riots. “In 2002, the then BJP Prime Minister, Atal Bihari Vajpayee, had reminded Modi of the principles of ‘raj dharma’ over his suspected role in deliberately delaying the deployment of security personnel post-Godhra riots. The BJP later lost the Lok Sabha elections in 2004 as the minority community feared Modi. He has only instilled fear among the minorities and the poor and won the elections in the name of communalism. 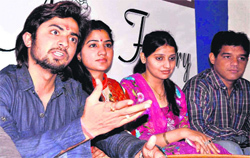 Such a person now casts apprehensions at the Gandhi family,” said Pandey. State secretary of the women wing cell Meera Raturi said even courts had criticized Modi’s role in investigations in the Godhra riot cases and if he becomes Prime Minister, it would lead to chaos and feeling of hatred among the people belonging to various religions. 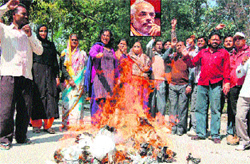 The activists said they would oppose Modi’s visit to Uttarakhand whenever he comes here. Monika Dhiman, Chandravati Gaud, Manoj Giri and Rita Verma also addressed the gathering. The BJP workers alleged that the proposed excise policy aimed at giving undue benefits to the liquor mafia in the state. They said while the government had failed to give relief to the common people by not withdrawing VAT on diesel, petrol and LPG cylinders, it instead proposed to give concessions to the liquor mafia in the state. The protesters raised slogans against the Congress-led governments in the state and at the Centre. They accused the Congress of being involved in corrupt practices. Satish Kashyap, general secretary of the mandal, alleged that the state government in its first year had utterly failed to ensure development and roads were in a bad shape even in the capital city. He said under the Congress rule the common man was finding it difficult to survive. Yesterday, the SSP had suspended the Rayasi check-post inspector for dereliction of duty. He had failed to take any action despite repeated complaints of illegal quarrying under way on the Ganga riverbed at Rayasi, Lakshar. SSP Joshi said illegal quarrying would not be allowed in the district at any cost and police personnel found involved with quarrying mafia would not be spared. He said they had earmarked sensitive zones and riverbeds and circle officers had been told to monitor the areas falling in their zone. Meanwhile, Tehsildaar Abrar Hussain said revenue teams were conducting raids on various riverbeds and stone crushers. In the past two days, 16 trucks and tractor-trailers had been been impounded at Mahtaulli , Bhogpur and Bishanpur Kundi. A delegation of the university met Chief Minister Vijay Bahuguna recently and urged him to take necessary action in this regard, so that students do not suffer owing to this. The delegation told the Chief Minister that the funds given by the state government were not sufficient to meet the expenditure of the university. “The university gets Rs 25-crore grant annually from the government while the expenditure on salaries alone is Rs 29 crore annually,” said Prof HS Dhani, pro-Vice Chancellor, who, along with Tharali MLA Jeet Ram, headed the delegation to the Chief Minister. Delegation members said the Chief Minister had assured them of looking into their problem and had decided to call a high-level meeting within two days in Dehradun. This camp was organised with the objective of promoting birdwatching thereby boosting up eco-tourism activities in the area of the Lansdowne Forest Division and providing employment opportunities to the locals. The Saneh-Kolhuchaur-Nauri circuit has been identified as one of the projects under the ADB-funded Inclusive Tourism Infrastructure Development Project. The area lies on the periphery of the Sonanadi Wildlife Sanctuary in the Corbett Tiger Reserve and is traversed by the Kotri river. There were 21 participants, including two foresters and 10 forest guards from the Lansdowne Forest Division along with local hoteliers, teachers, research scholars and the youth. Dr Pratap Singh, Chief Conservator of Forest, and Dr Raman Kumar from the Nature Science Initiative conducted the birdwatching camp by covering all the aspects of birding. The participants were introduced to the concepts and details of birdwatching through power point presentations and movies, which were supplemented by long field visits the areas of Dhimki, Chaukhamb and Nauri. Participants were taught how to use binoculars and bird field guides in the workshop. The group had the opportunity to see 110 species of birds, including the rare ones like blue-throated parakeet, stork-billed kingfisher, great slaty woodpecker, crimson sunbird, collared falconet and black-crested bulbul. Dr Paratap Singh and Amit Verma, Divisional Forest Officer, Kalagarh Tiger Reserve, gave certificates to the participants at the conclusion of the camp. According to sources in the Irrigation Department, of the 29 canals in the valleys of the district only 14 are full to capacity while the remaining of them are not in an operational condition following damage due to landslides. Of the irrigation capacity of more than 300 hectares of these canals, only 150 hectares are being irrigated in the valleys,” said KN Punetha, SDO, Irrigation Department, Champawat district. The sources say a proposal of Rs 26.68 lakh has been sent to the higher authorities for the repair of damaged canals but farmers are suffering as no grant has been received so far. “The dry weather conditions have been prevailing in these valleys since last week in the absence of rain. “As the canals in Koteshwar and Phungar have been permanently closed and the canals in Kaljakh, Dhakna, Garsari, Okhaldhunga, Chanchalpur, Byuri and Tarkuli have been abandoned by the department, the rabi crops in the valleys will be badly affected this year,” said Chandrasekhar Joshi, a farmer of Garsari village. The shifting of the snowline has led to warm winter, thus posing problems for apple growers who bank heavily on a prolonged cooling period for the ripening of the crop. “While there are no credible studies on the Himalayan snowline that has been reported to be shifting downward in the last four decades, the phenomenon has definitely impacted the state farmers who are now being encouraged to invest in high density planting material,” said Dr BS Negi, Director, National Horticulture Mission. “The spur varieties of apple do not attain much height and begin to bear fruit in two years. Above all they do not require low chilling temperature. These varieties are being propagated in Ranikhait, Chamoli and Nainital,” Negi added. “The spur varieties are quite popular among the farmers in Europe and the USA and we are encouraging the local farmers to go in for these in a big way. The high density plantation is also being done in Nainital at a mini-orchard and these varieties will then be given to the farmers under the National Horticulture Mission scheme,” said Negi. He added that the spur varieties would be a boon to the farmers who were still dependent on the seeds that took as long as 10 to 15 years to grow and bear fruit. The commercially grafted trees could bear fruit as early as from three to four years. The apple production was around 1.22 lakh metric tonne in the state during 2011-2012 compared to 1.35 lakh metric tonne during 2010-2011. “Further the department is also promoting the plantation of pomegranate, apricot, walnut, kiwi and plum fruits among the farmers to increase their fruit basket,” Negi said. “There is less flowering in the mango trees as most of the early flowering has damaged. The frost in the plain areas was quite severe during the winters,” said Dr BS Negi, Director, Horticulture Mission. Though officials are still compiling reports, the damage has been estimated on around 50 hectares of land in the Terai region. In Dehradun district, the Doiwala block has been the worst affected. Badly hit by the damage caused by the frost, farmers are already demanding compensation and the Department of Horticulture has asked the district horticulture officers to assess the damage. A scientist from Dakrani has also been sent to salvage whatever is left of the crops. “The frost affected the transpiration process. In such a situation, the farmers are advised to ensure that regular supply of water is maintained,” said Dr Amar Singh, District Horticulture Officer. Inaugurating the seminar, Dr Rajendra Dobhal, Director General, UCOST, said the youth were important stakeholders in shaping the global environmental agenda. They could be actively engaged in raising awareness, running educational programmes, advocating for policy-level changes, designing innovative solutions, technologies and tools and strengthening public participation for environmental protection. Highlighting the importance of such initiatives, Prof GB Pant, a former Director of the Indian Institute of Tropical Meteorology (ITM), Pune, said such seminars provided an important forum for enthusiastic individuals willing to voice their opinions and contribute towards a sustainable future in the arena of the environment in general and green growth in particular. Earlier, Taru Mehta, area convener and associate fellow, Educating Youth for Sustainable Development (EYSD), TERI, briefed about the objectives of the programme. Neha, fellow, EYSD, said such seminars would also be organised in Maharashtra, Goa, Madhya Pradesh, Haryana, Assam and Punjab in the coming weeks. The seminar series follows the successful culmination of the recently held YUVA (Youth Unite for Voluntary Action) Meet-2013 in New Delhi, which witnessed the participation of over 200 youngsters from eight countries. The first day of the event today featured panel discussions on sustainability issues. A panel discussion on, "Fundamentals of green growth" highlighted the importance and the need for environment-friendly development practises in India. A lecture by Dr KN Bhardwaj, UCOST, Dehradun, on “Social and science and technology-based entrepreneurship opportunities for youth", provided an insight into green jobs with suitable self-employment opportunities and behavioural changes required to conserve the environment with development in Uttarakhand. In the afternoon session, a film titled "Half: A View" was also screened and later on its aspects were discussed with the participating youth and teachers. The jawans said in the times of high inflation they were being paid a pittance and still they were doing their job with honesty and dedication. They added they were promised Rs 300 per day as remuneration but nothing had happened. The jawans requested the Chief Minister to take a decision to enhance their salaries at the earliest as they were finding it very hard to feed their families. The Chief minister assured the delegation to look into its demands. He said special attention should be paid that the schemes benefited the areas and people whom they were supposed to benefit. The CM was reviewing the budget for schemes for the SC/ST communities and said all departments should prepare a plan regarding the benefits reaching the people in the areas where the schemes were operating. He asked officials to accelerate the pace at which the schemes were being implemented. Bahuguna said the government was also paying attention to the welfare of the minorities and the economically backward sections of society. He said all departments should plan to introduce programmes and schemes which could be added to the efforts already being made for their welfare. In a tete-a-tete with TNS after attending a function, Shailesh Lodha said in India it’s not just cricket, politics and films which bind people, but the laughter. Citing numerous shows running on television on humour, Shailesh said the lost art had revived, with many poets being recognized both by poems and face. Lodha, who is also anchoring "Wah Wah Kya Baat Hai" on Sab TV, is quite upbeat about the new talent coming in this field. “In this show, we invite veteran and raw talent and the success of the show rides on their shoulders. New ideas by young poets mesmerize us. There is a whole new lot coming which will take humour poetic genre forward,” added Shailesh while giving autographs and poses with his numerous fans. Having written two books on humour, Lodha is enjoying the record sale of his latest book titled "Diljale Ka Facebook Status” which is a collection of poems written from the point-of-view of a jilted lover. On his satire on politicians, Shailesh said, “By this, we also keep a tab on their work andbehaviour and slightly work as guardians of democracy. He pointed out that the common citizens too couldn’t escape from duties by just opposing or blaming politicians. “We have to look into our conduct too as corruption is deep-rooted in our society where we take and give bribes too,” he said. “Not giving taxes is one simple example, we need to keep us clean too, then only we can blame others,” he added. Citing the Arvind Kejriwal-led Aam Aadmi Party's example, Shailesh said in the initial phase sitting at Jantar Mantar the members ridiculed the political class and the government but now they had plunged themselves into a political entity and wanted to enter Parliament, which was quite surprising. Named Actor's Factory, noted television actor Diaansh Sharma, who has acted in more than a dozen television soaps and documentaries, will be honing the raw skills of potential youngsters who want to make a career in film and television field. Talking to TNS, Diaansh Sharma, who acted in television serials like Ramanand Sagar's "Sai Baba" serial, essaying the child role of Sai Baba, Prithvi Raj Chauhan, Veer Shivaji, Kali, Adalat and CID to name a few, said initially he too found it hard to get a breakthrough in glamour world. "Later when I got chance, lack of exposure, raw acting skills, lack of knowledge of voice modulation, etc proved hindrance for me and several others who hailed from small towns. It was then that I had decided that when I make a name for myself, I will provide a training platform to youngsters from Uttarakhand," said Sharma. Citing lack of theatre experience, knowledge about the film industry and getting swayed by glamour limelight, Diaansh warned youngsters that it's quite tough to make it big and hard work was the only key to be successful. "Theater is the soul of acting. Without it, one can't get into nitty- gritty of acting. Be it Nasseruddin Shah, Om Puri, Amol Palekar, Irfan Khan or Deepti Naval, their acting skills look more realistic, due to theatre experience only. We will also be bringing renowned theatre artistes from Delhi, which is a hub of theatre, to Haridwar, so that our students get fully honed," said Diaansh. The event was won by a team comprising Aarti, Priya and Kanchan. The team of Neelam, Renu, Varsha Chaudhari, Varsha and Upashna Arya was declared first runner-up. The second runner-up team comprised Nutan Prasad, Nidhi Bakshi, Mansurri, Nargis, Shivani, Ansu and Baby Kaynath. College Principal Sunil Kumar Batra gave away the prizes to the winners. Dean, Students' Welfare, Sanjay Maheshwari, Dr Saraswati Pathak and Dr Nalini Jain were the judges for competition. Meanwhile, a volleyball tournament also began at the college ground today. Six teams are participating in this event. The inaugural match was won by the BCom team.